Really lovely little restaurant, tasty food, very nice owners. Excellent mais un peu cher ! This place is just incredible. Very warm staff and extremely delicious dishes. Especially the mille-feuille à la fraise! Very impressive. Excellent restaurant. À visiter sans hésiter. The reservation system worked well and the welcome was very friendly. The starters and main courses were all of excellent quality and the waiter explained everything to us, even giving us the recipe for "Pommes Darphin". We were given a sample of the wine we were ordering so that we could decide whether to have a bottle. Everything was perfect for our Sunday lunch and the restaurant is opposite the parking and close to the Chateau. Really amazing place. Tasty food and good service. Degustation menu is perfect! Thank you so much! Great fish and dessert (chocolat tartelette). Nice restaurant, very cozy and clean. Went for lunch and the ambiance was calma - nice music and not mucha noise. Staff (Daniel) very efficient and supportive. A true jewel and worth taking the short walk down the main street and away from the touristic cluster of restaurants in the shadow of the chateau. The menus change and are very ambitious, with a use of seasonal products. Overall an excellent experience. Delicious meals around the whole table of 4 of us, for all 3 courses eash. The entree+plat+dessert deal is very fairly priced. Friendly, attentive and helpful waiter who enjoyed his role in the evening and made it a pleasure to be there. Great place!! very cozy and quiet, perfect ambient for couples. 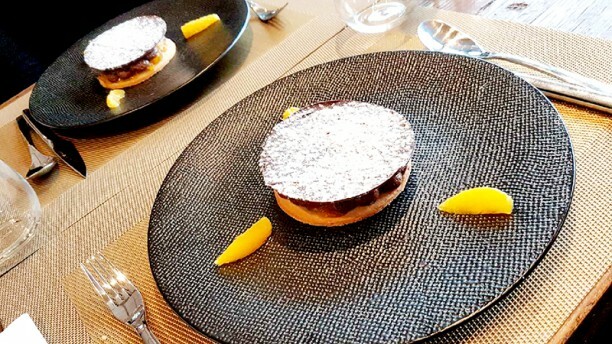 The menu is simple but everything is very appealing the food was perfectly balanced in taste with a beautiful presentation and the dessert (moelleux au chocolat noir) is to die for! !